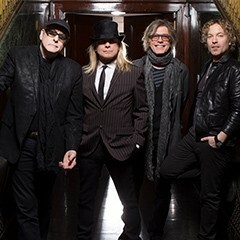 Cheap Trick is part of the very fiber of American music, inspiring and delighting generations with their unique union of massive melodies and razorblade riffs, their own special brand of mischievous wit and maximum rock ‘n’ roll. Frontlined since 1974 by Robin Zander (vocals, rhythm guitar), Rick Nielsen (lead guitar), and Tom Petersson (bass guitar), the Rockford, IL-born Rock and Roll Hall of Famers are as vital today as ever, having released three spectacular records in the last three years — BANG ZOOM CRAZY…HELLO (2016), WE’RE ALL ALRIGHT! (2017) and CHRISTMAS CHRISTMAS (2017) – and toured relentlessly to packed audiences around the world (four decades/5,000+ shows). “The energy levels are astounding,” shouted Classic Rock, “with producer Julian Raymond extracting a sonic attack that makes Rick Nielsen, Robin Zander, Tom Petersson and Daxx Nielsen sound like they’ve been locked in an industrial hangar with a bunch of AK-47s. “If 2016’s terrific BANG ZOOM CRAZY…HELLO was a long-awaited comeback after a seven year lapse, then this year’s rapid follow-up shows that was no anomaly,” declared American Songwriter.